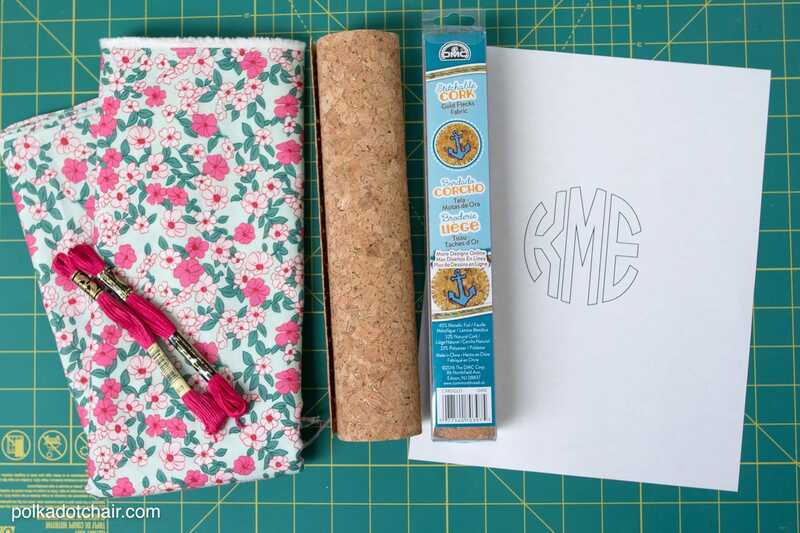 The first thing you will want to do is transfer your monogram pattern onto the cork. 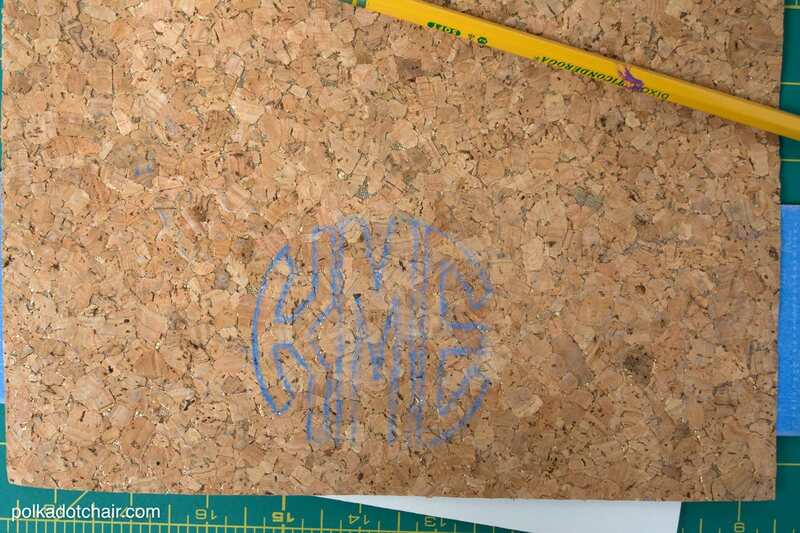 In retrospect I wish I had placed my monogram about 1″ higher on the cork piece, so I’ll share those directions with you. 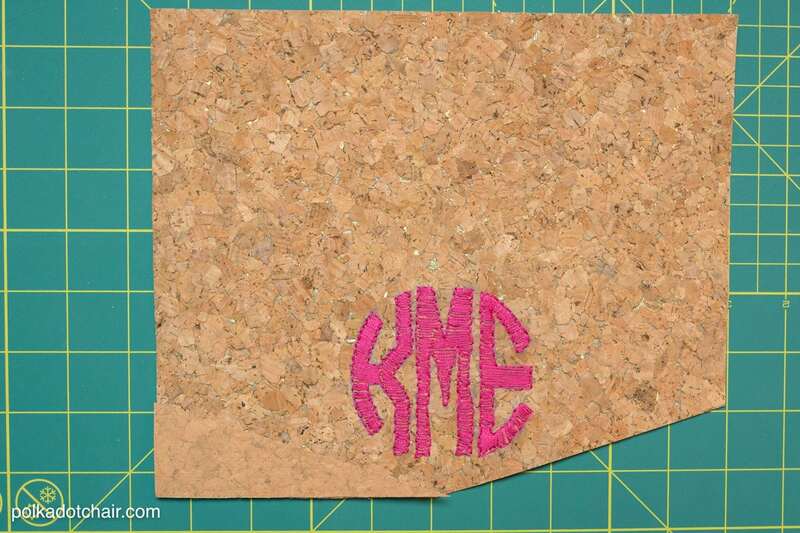 Cut out your monogram and place it on top of one of the 10″ x 10″ pieces of cork, make sure that it is centered on the cork and the bottom of the monogram is 2″ up from the bottom edge of the cork. 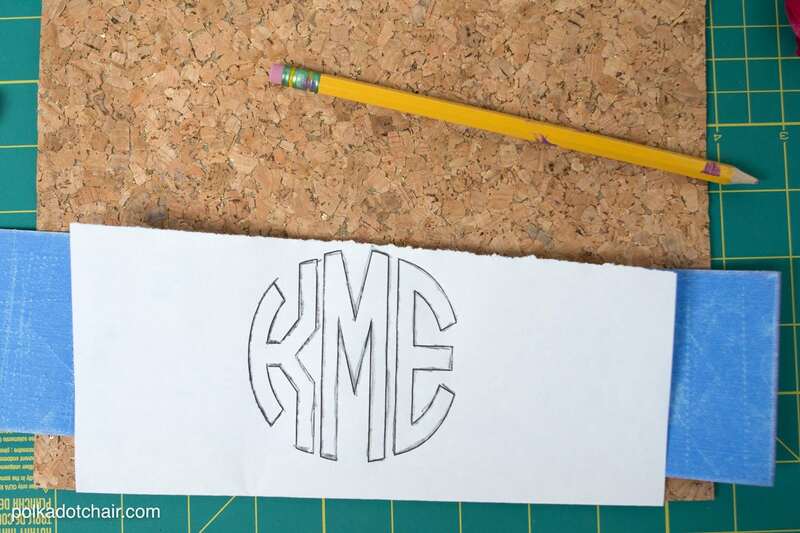 Place the tracing paper behind the monogram and using a pencil trace the monogram. The monogram should transfer to the cork. 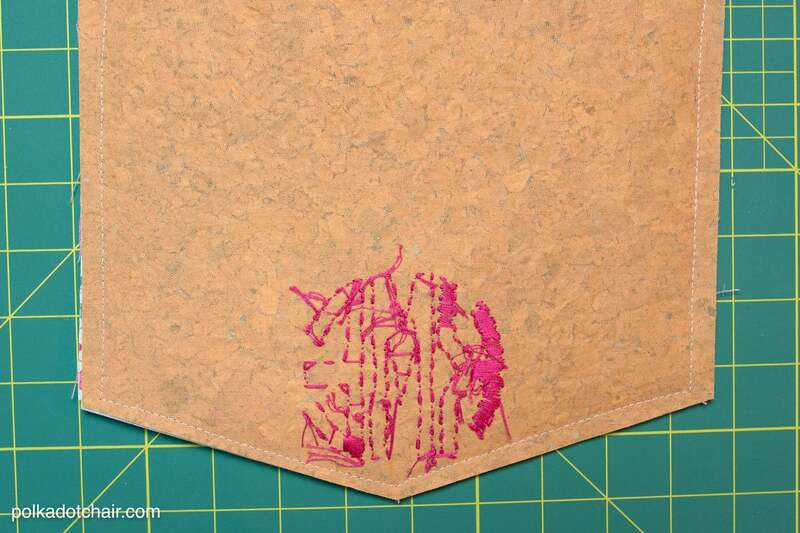 Use a fabric safe marking pen if necessary to fill in any spots that did not transfer well enough. Place the cork in an embroidery hoop. 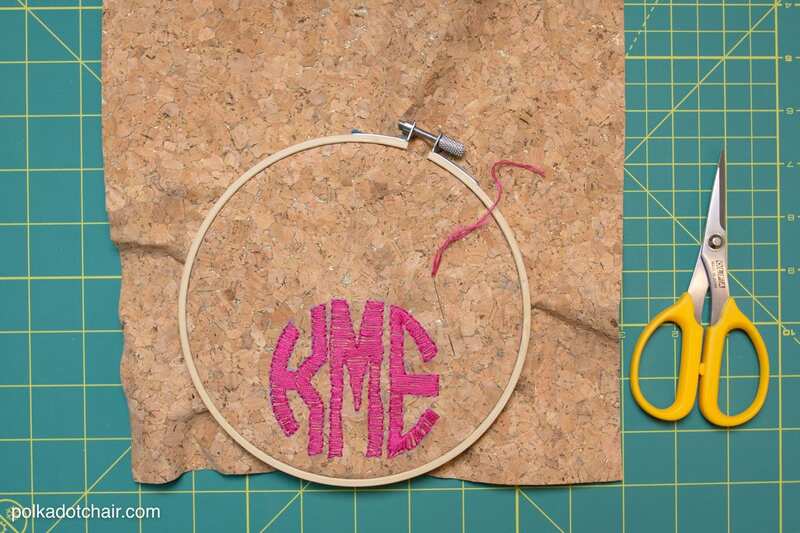 You can now embroider your monogram. To do this, outline the letters first using a simple backstitch. Then fill in the letters with a simple satin stitch. 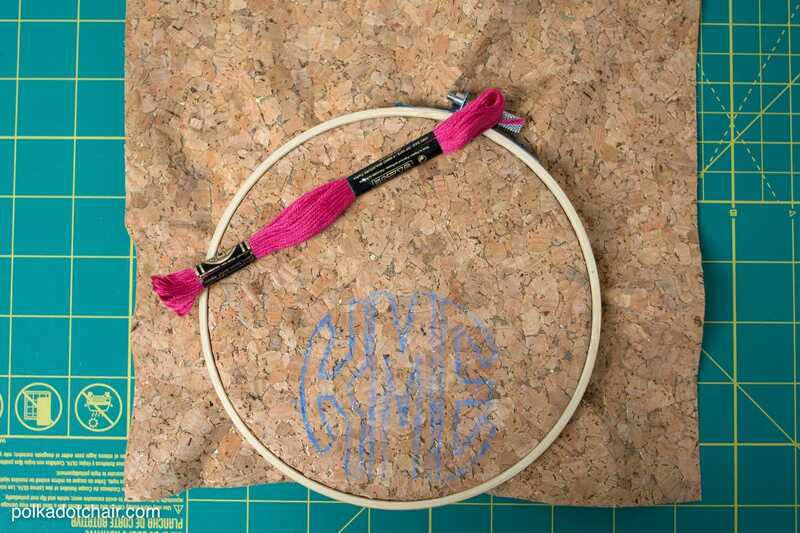 I used 3 strands of embroidery floss to create my monogram. Remove the cork from the embroidery hoop and press it so that it lays flat. I used a pressing cloth each time I needed to iron the cork. Find the bottom center of the embroidered cork piece. Mark it. Mark the edge of the piece 1 1/2″ up from the bottom. Use a ruler and draw a line from the center bottom to the 1 1/2″ mark. Cut. Using the piece you just cut as a guide, cut the other half on the cork. Now cut the cork so that it is 8″ tall. 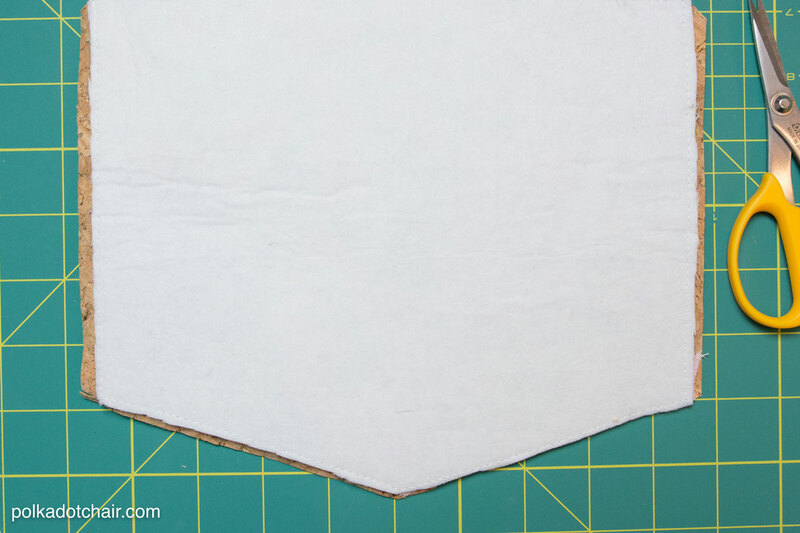 Using this piece as a guide, cut your 8″ x 10″ interfacing and lining pieces the same shape. 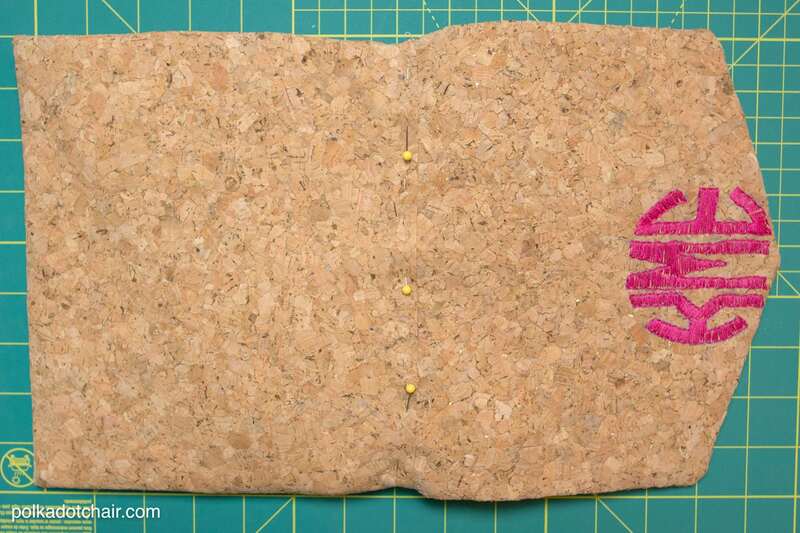 Create the clutch flap: Layer the cork and the lining pieces right sides facing. Place the interfacing on the wrong side of the lining piece. 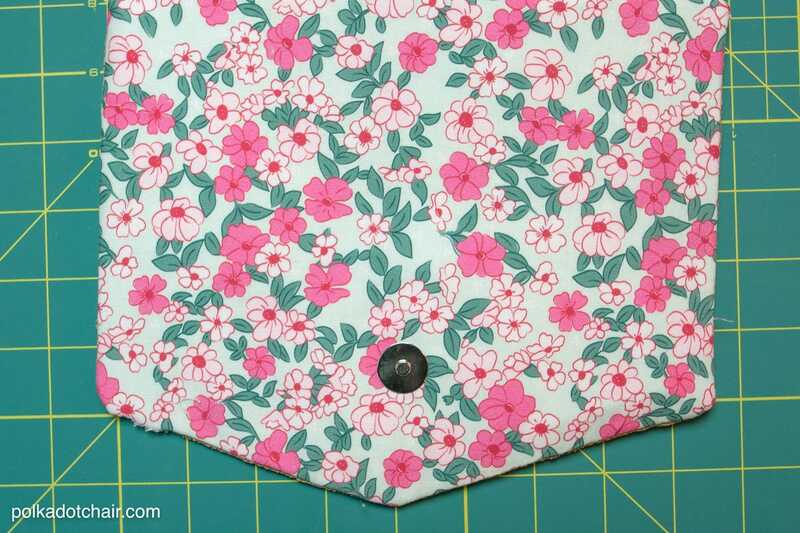 Stitch all layers together using a 1/4″ seam allowance. (I find it helpful to use a walking foot whenever I’m stitching multiple layers together like this). You will leave the top of the flap piece open. Trim the corners. 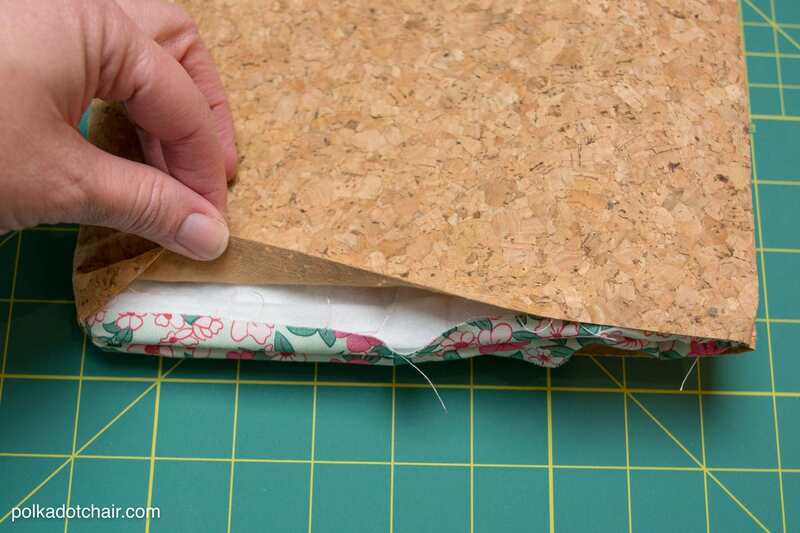 Cut the seam allowance of the interfacing down to a scant 1/8″. Turn right side out and press. On the lining side of the flap, find the center of the flap piece. Measure up 2″ from the point of the flap and place a mark. Set a magnetic snap on top of the point you just marked. 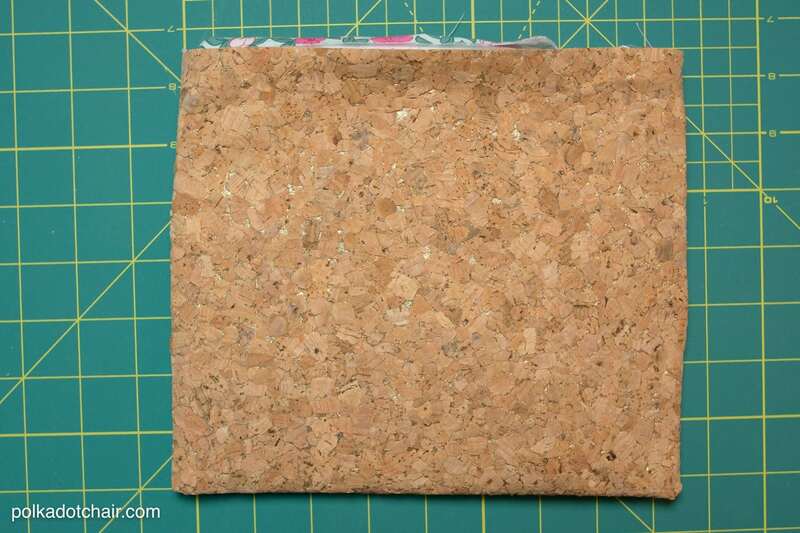 The snap will go through the interfacing and the lining but NOT the cork. 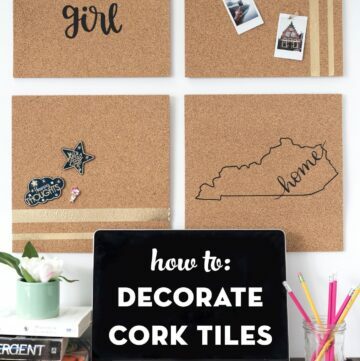 Place the two 8″ x 10″ cork pieces together right sides facing. Stitch with 1/4″ seam allowance, leaving one 10″ side open. Place the two 8″ x 10″ lining pieces right sides facing, place one piece of interfacing on the wrong side of each of the lining pieces. 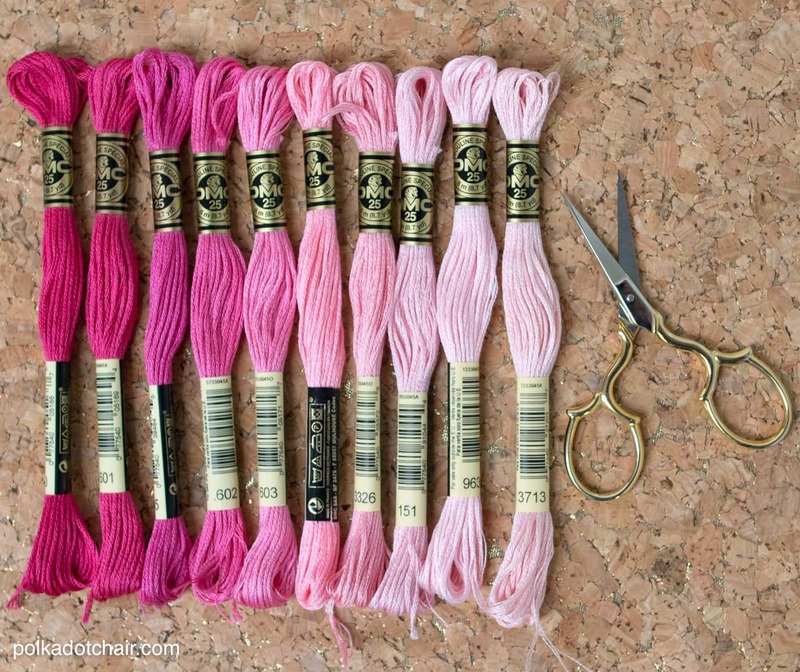 Stitch together using a 1/2″ seam allowance, leaving one 10″ side open. Trim the seam allowance down to 1/8″. Fold under the top raw edge 1/4″ and press. Slip the lining into the sewn cork clutch piece. It should fit snugly. If not adjust the seam allowance of the lining as necessary. Line it up so that the edge of the cork is even with the folded edge of the lining. Pin well, but don’t sew it yet. 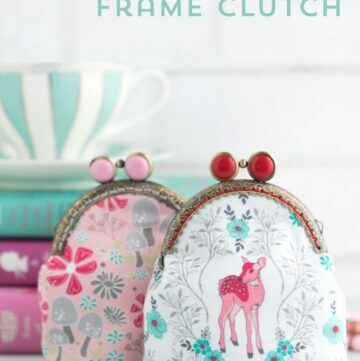 Slip the flap piece into the clutch piece. Stitch in place. Start and stop stitching at the edges of the flap. To finish the clutch, top stitch along the other side of the clutch (the side that does not have the flap attached). Fold the flap over and note where you’d like the flap to hit on the clutch front. Place a mark where the magnetic snap meets the front of the clutch. Set the other half of the magnetic snap on this mark. This snap will go through all the layers of the clutch. 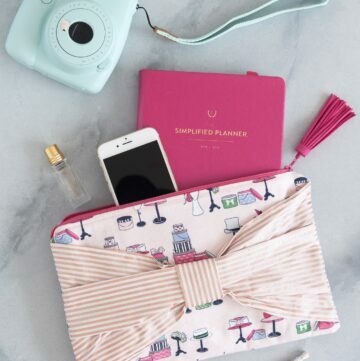 I just adore this clutch Melissa!! 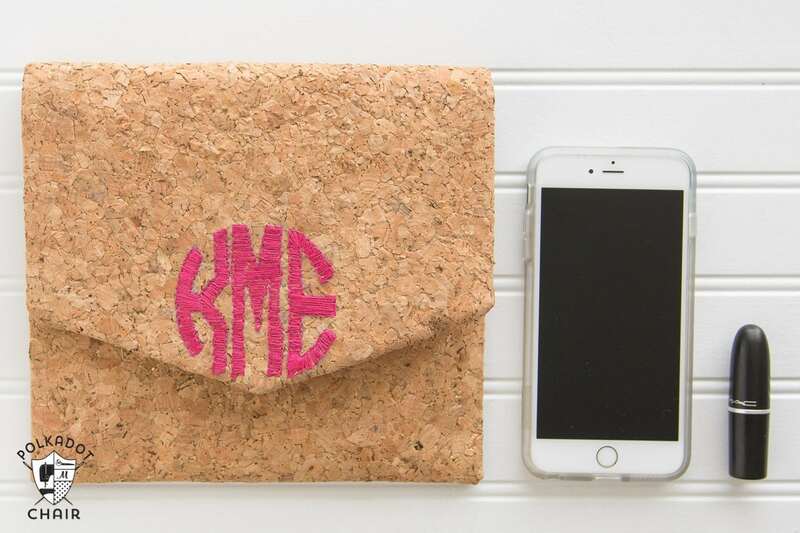 It is so fun in the cork and the monogram really stands out. 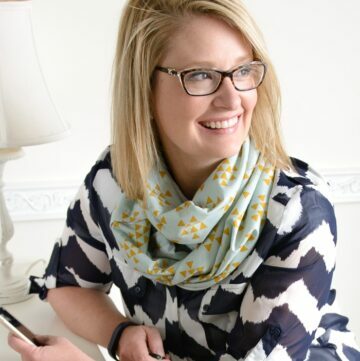 And of course I love your new fabrics – they are so pretty!! Can you order from Amazon in Canada? This looks awesome, would love to try out the stitchable cork, must go out and buy some!